Day one onboard the Dam ship! After a comfortable and very pleasant nights stay at Swissotel in Market Street, we woke quite early and took a quick walk (in the rain too, not unpleasant either as it's only a light drizzle, and it's something we haven't experienced for over 4 months in Perth!) 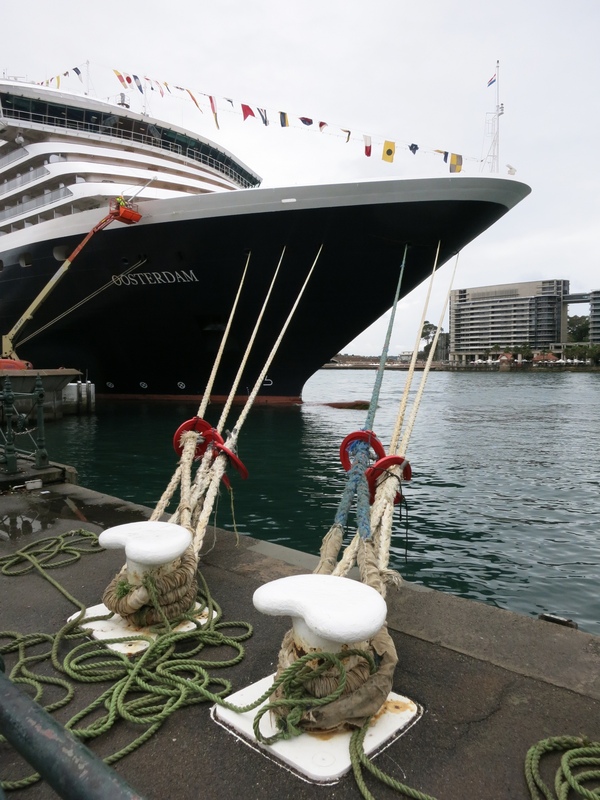 down George Street to Circular Quay to take a look at what will be our floating home for next 29 nights, the Holland America Line ship, 'Oosterdam'. While there, we find out that the embarkation has been brought forward by two hours, 11am instead of 1 pm. Due to Cyclone Ita, the Captain has decided to leave Sydney at least 2 hours earlier than scheduled, in order to try and avoid the worsening sea conditions. We had spoken to a couple of disembarked passengers from the last cruise, who told us that the previous night, on the way in to Sydney, the seas were quite rough. We headed back up Pitt Street to our hotel, and prepared to check out. I'd have to say that the service at the Swissotel couldn't be faulted, especially the help given to us by Andrew, the young concierge. With our 4 suitcases, 2 carry-on bags, 3 cases of wine ( yes, but they were only 6 packs…. whatdya think we are, soaks?) plus a large box containing Choc-Mint biscuits, jelly snakes, Milo, Vegemite, Tea bags, souvenirs etc ( all items for daughter who tells us that none of which can be bought in Canada!!!) Quite a handful to get into the taxi, but we did have four ( yes 4) staff of the Swissotel helping us to pack it all in the station-wagon type cab. The cabbie, of Chinese ethnicity, asked if we were emigrating! 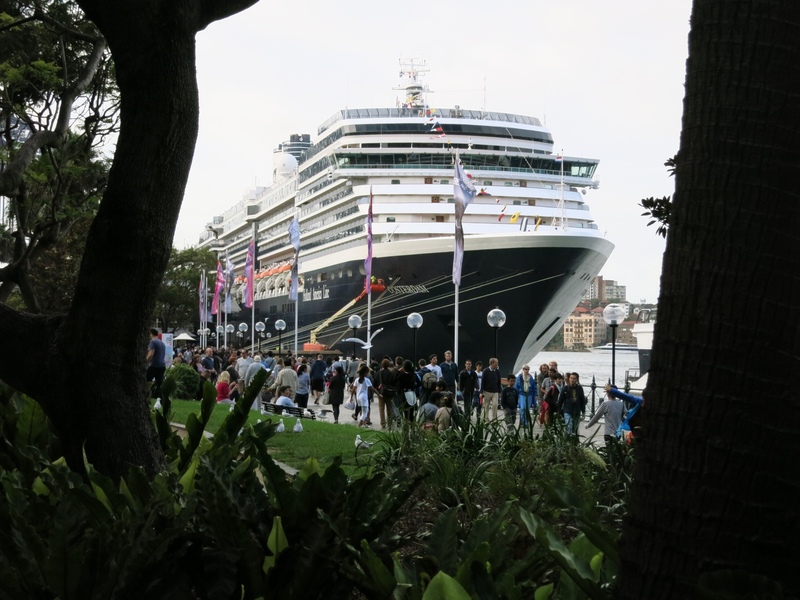 ” No mate, we are going on a ship, and we'd like to go to Circular Quay” He stopped at the corner of Market & George and asked ” You going on Ferry Boat?” No, I explained, we are going on a ship, a big ship, not a ferryboat…. it leaves from Circular Quay… you can't miss it, it's bigger than the Opera House…….. “Opera House” his face lit up, “you want Opera House?” ( you wan opwa how?) 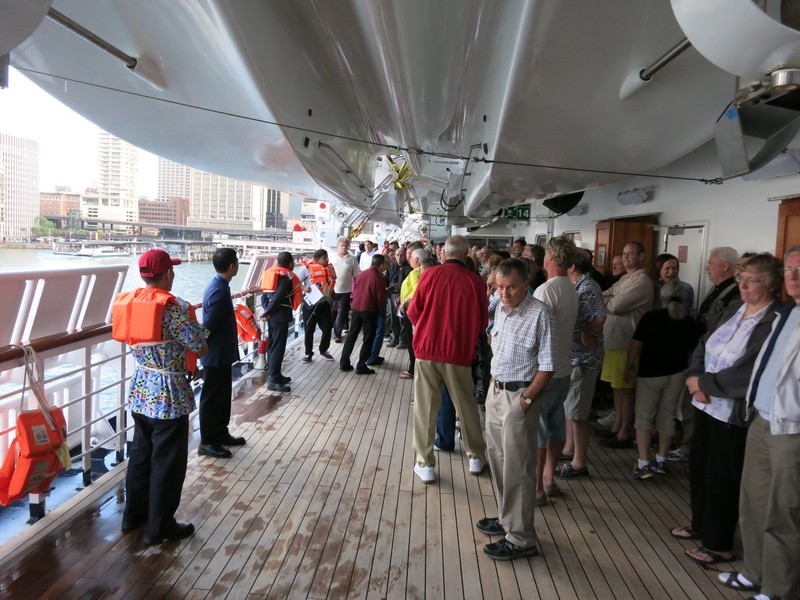 …..No, we want Circular Quay….. you know, where the Cruise Ships berth, you need to drop us there. ” Ah, Cruise Ship, now understand, why you no say, you want International Cruise Terminal, right?” though not at all pronounced as I've written it. No mate, not the International Cruise Terminal ( which I knew to be a brand new facility, miles away in woop woop.) 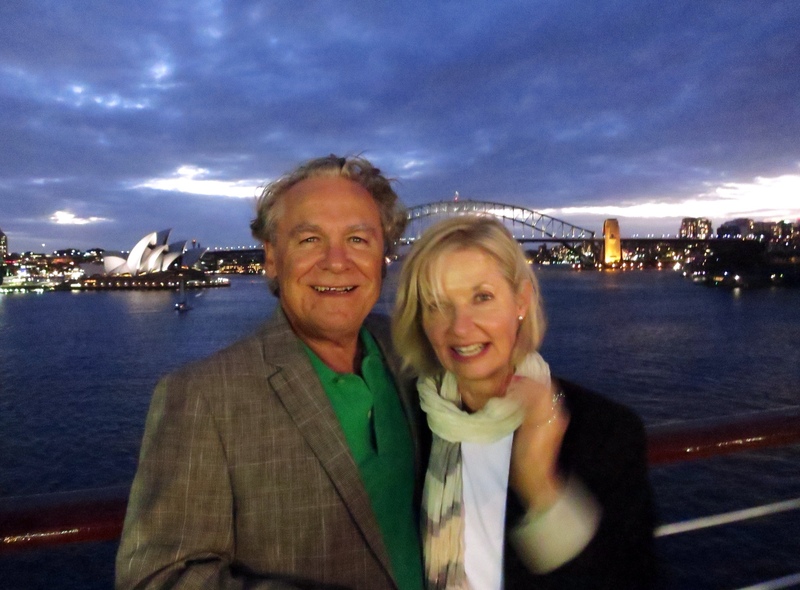 Circular Quay, I'll show you the way…. and so I did. On the way I asked him how long he'd been in Australia ” 24 years” he replied, ” but not my job driving Taxi, only at weekends” I asked him what his 'real' job was…. ” Australia Post, parcels,sorting and delivery” …. Mmmm, that could explain why my parcels sometimes get lost…. Apart from his poor knowledge of Sydney geography, he was a friendly and amiable character, and when we arrived outside the terminal at about half-past twelve, he helped us out with all the luggage. Just as well they started embarkation earlier, because the queue would have been even bigger otherwise! It snaked right outside the terminal and around the corner. I managed to find a porter to take the 4 main pieces of luggage, and YM and I shuffled along at snails pace with the remainder, waiting in the long line. Waiting isn't one of the things that YM is very good at….. her speciality is to find a way to avoid it whenever possible. 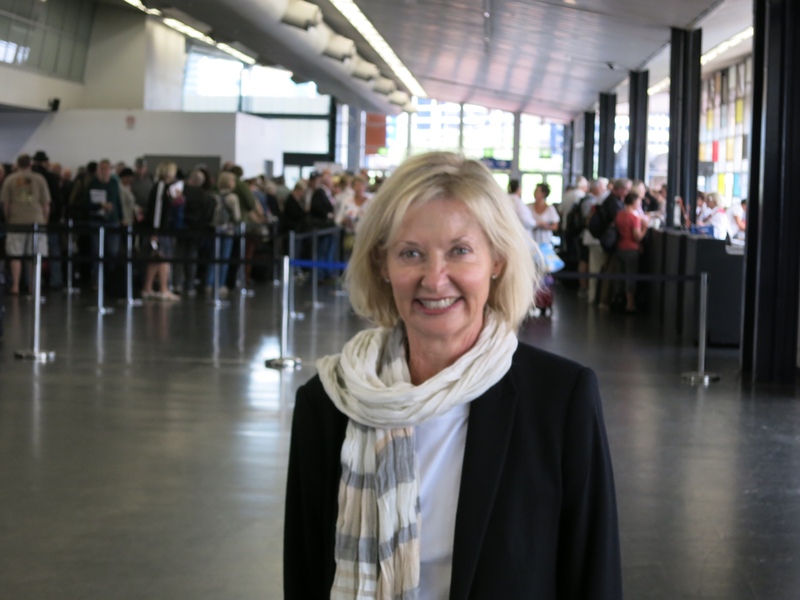 She moved all the hand-baggage and parcels etc to the other end of queue where it entered the terminal, and then waited for me to arrive with the queue. About 2 minutes later, a lady in a uniform approached me and asked if I'd lost my wife ” Not lost her” I replied, 'just mislaid” …. “Come with me” she said ” she's waiting for you” and with that she escorted me to the front of the queue, up the escalator, and into the check-in hall, right past all the other people waiting in line to be processed. 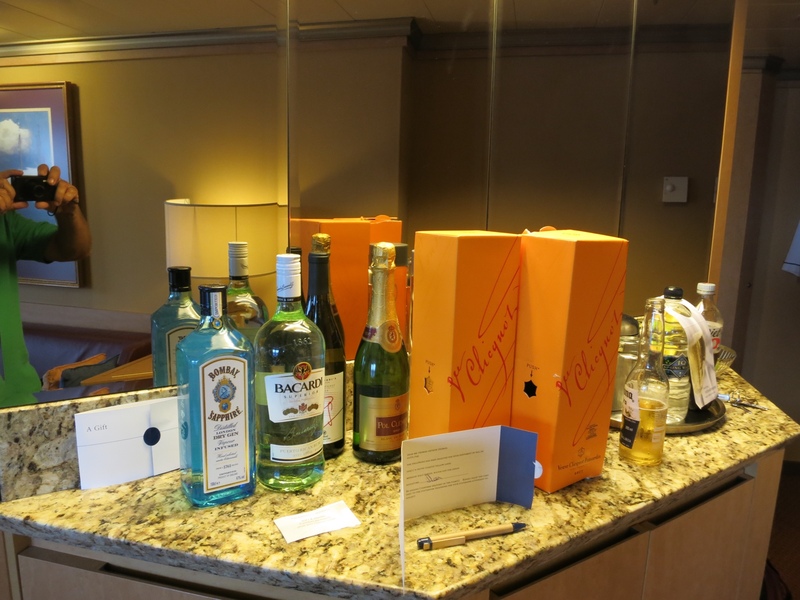 A nice surprise was waiting for us, as on the bar in the suite were 2 bottles of Veuve Cliequot champagne, a ' Kalo Taxidi' gift from my very best mate BL….thanks buddy, I now regret saying all the nasty things about you!!! After completing the compulsary lifeboat drill at 5pm, ( We are assigned to Lifeboat 16, and the person in charge of it is one of the Male dancers in the revue…. good dancer, but what about his seamanship skills?) 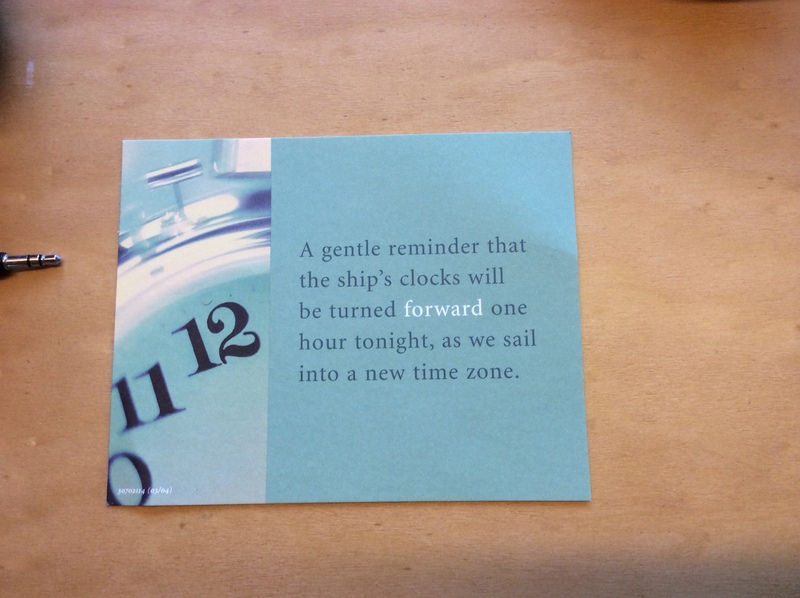 we set sail just before 7pm. 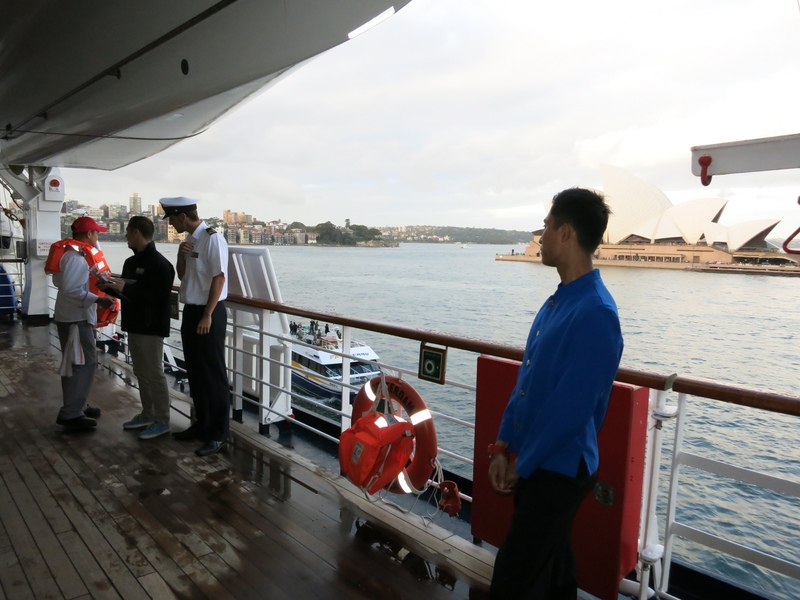 The rain has at last stopped, and we go up onto the sports deck to watch our departure from Sydney …… and it's still a thrill leaving this spectacular harbour by ship….even 40 years later! PS: and no, before you ask…… once again I sailed pass Sydney Heads into the open Ocean, and yet again failing to achieve the goal set all those years ago by the Australis Shop Boys. Many tried, only a few succeeded….but still not I, alas. In Sydney but you didn’t visit your old mate Pete! You could have changed the story and said you left from Brisbane. Just kidding, please keep the stories coming, I’m travelling vicariously through your blog. How to queue jump… what a great tip, thank you YM! My tip, hide your booze, have always managed to get it on board in Soton in the luggage! Cant possible imagine what you had to do before Sydney Heads to earn the admiration of the “boys”!